1 Thessalonians was one of the earliest epistles of Paul, if not the earliest. Paul’s ministry in the prosperous city of Thessalonica was recoreded in Acts 17 1-10. Having been forced to leave the city of Thessalonica abruptly in a hurry as soon as it was night [Acts 17:10], Paul was naturally anxious about the situation of his brothers. The theme of this epistle, according to Mark Copeland, is holiness in view of the second coming of Christ, as Paul offers many instructions concerning holy living. In 1 Thessalonians 5:12-22, Paul offers his final instructions to the Thessalonian Church not unlike his instructions to other Churches or brothers. While he did not go in depth into each of these instructions, as they were his concluding words, they offer a quick idea of what Paul desires for the Church. In looking exclusively at 1 Thessalonians 5:19, we will be looking into the Holy Spirit and its association with the metaphorical fire. 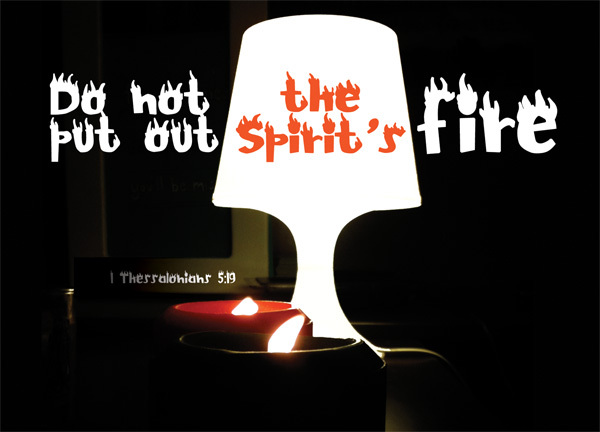 The Holy Spirit has on several occasions in the Bible been associated with fire. For example, John the Baptist says, “He will baptize you with the Holy Spirit and with fire.” [Matthew 3:11] The idea of the holy fire has been seen in Moses‘ time, when the angel of the Lord appeared to him in flames of fire from within a bush [Exodus 3:2]; in Jesus‘s time, when He proclaims “I have come to bring fire on the earth, and how I wish it were already kindled!” [Luke 12:49], and in the days of the early Church, when the apostles saw what seemed to be tongues of fire that separated and came to rest on each of them [Acts 2:3]. Moses and the apostles saw, literally, a fire, but here Paul refers to a metaphorical fire. Why the metaphor of a fire? It could possibly have been an allusion to the fire of the altar, which has to burn continuously. We may be more familiar with the Olympic fire – which is supposed to be passed along the Olympic route without dying out. Fire has traditionally been associated with love and passion, devotion and zeal – and here Paul uses the imagery of a fire as a symbol of the true devotion as he instructs the Thessalonian Church not to reject the influences or the promptings of the Holy Spirit in our hearts. How can the Olympic fire not die out? How can the fire on the altar burn on continuously? If left to its own devices, a fire will eventually die out. It requires meticulous care and attention, it requires a constant supply of fuel and careful protection from external influences, such as the wind. Likewise, if we choose to ignore the promptings of the Holy Spirit, even if we do not pour water on it or cover it up with a lack of oxygen, it can extinguish. Here, it is important to note that just by indifference we are rejecting the Spirit. It doesn’t take a blatant effort to sin or to go against the Spirit’s prompting. Just by ignoring the prompting of the Spirit in our hearts, we’re extinguishing its fire. 1 Thessalonians 4:8, upon delivering a set of instructions on holy living, Paul says, “he who rejects this instruction does not reject man but God, who gives you his Holy Spirit.” Have you ever been rejected by man? How did it feel? More likely than not, it was unpleasant, it was hurtful. Yet, who hurts most, the rejected or the rejector? While debatable when it’s a human-to-human relationship, but often, when you reject God, you will find that you’ll end up more hurt than when you are rejected by men. Are you rejecting the Spirit’s prompting? Have you extinguished the Spirit’s fire? Admittedly, I have, many many times. Even in the smallest of things, when temptations arise and I succumb to them; when I know what is the right thing to do but took the easier way out… this verse comes back to my mind, and I know I need to seek forgiveness. If we reject God, God will also reject us; but let us have hope, because God cannot reject himself [2 Tim 2:11-13]. As we grow in our faith and as we continue to study more and more about God’s words, our knowledge and understanding of God becomes bigger, and our God of today is bigger than our God of yesterday. As our God becomes bigger in our hearts, let us pray that this verse will come into our minds before we put out the Spirit’s fire.